The police officer who struck and pushed 47-year-old newspaper vendor Ian Tomlinson during London’s G20 protests in 2009 could face manslaughter charges after a inquest found Tomlinson had died of internal bleeding. 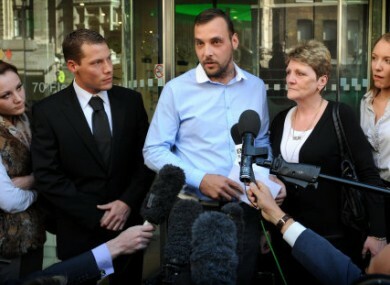 Paul King (centre), the son of Ian Tomlinson, and his widow Julia (2nd right) speak to the press after the inquest into Mr Tomlinson's death was delivered as an unlawful killing. THE DIRECTOR OF Public Prosecutions in the UK is to review evidence that has emerged from an inquest into the death of Ian Tomlinson, a newspaper vendor who died after being hit and pushed to the ground by police at the G20 protests in London in 2009. Yesterday, a jury said that Tomlinson had been unlawfully killed after six doctors agreed that he had died of internal bleeding after being hit with a baton and forced to the ground by a police officer, the BBC reports. The jury did not name the officer in question – PC Simon Harwood – due to legal reasons, however they did say that an “excessive and unreasonable” amount of force had been used and that Tomlinson had “posed no threat”, reports the Guardian. Tomlinson, 47, had not been involved in the protests and was walking home from work through central London when he was attacked. Keir Starmer, the director of public prosecutions, said that the decision taken last year not to prosecute Harwood would immediately be reviewed. Following Tomlinson’s death in 2009, police initially denied that he had come into contact with police officers. However, footage obtained by the Guardian showed that the newspaper salesman had been struck by police. The investigation into the cause of Tomlinson’s death also ran into controversy: the first pathologist to examine his remains, Dr Freddy Patel, returned the verdict that the 47-year-old had died of a heart attack. Despite three further pathologists subsequently examining the body and returning a verdict of death from internal bleeding, the attorney general Dominic Grieve backed Patel’s initial report – prompting a furious public backlash. Email “Inquest finds Ian Tomlinson was unlawfully killed at G20 protests”. Feedback on “Inquest finds Ian Tomlinson was unlawfully killed at G20 protests”.